Which Is The Best Water Filter For Home Use? Which is the Best Whole House Water Filter System for Your Home? Whilst municipal water is generally safe to drink in the UK in as much as it won’t make you ill this doesn’t mean however that it’s necessarily healthy for regular consumption. That many people do not fully trust their tap water is evidenced by the sales of bottled water with sales in the UK worth 2.4 billion in 2017. That’s a serious amount of money being paid out by the consumer and doesn’t take into account the cost of disposal of millions of single use plastic bottles or the environmental impact. Thankfully there is an alternative which more and more people are turning to and that is to install a domestic water filter for home filtration . So What Advantages Do Home Water Filters Give? Convenience - No lugging home of heavy bottles of supermarket water. No waste disposal problems. Filtered, reliably safe water flows from your tap at the turn of a handle. Cost Effectiveness - Home filtered water will save you a considerable amount of money compared to the cost of expensive bottled water. 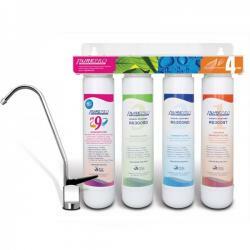 Easy Installation - Today’s water filter systems are designed for easy DIY installation and are often available as full kits which include a dispenser tap, connectors & hose and come with full instructions. 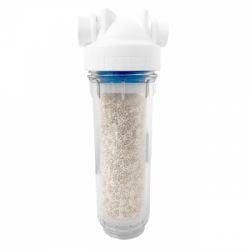 Efficient, Reliable Filtration - Modern water filter media of various types, often in combination, are able to remove or seriously reduce a huge range of common contaminants, including heavy metals, herbicides, pesticides, hormones and many other chemicals, as well as biological hazards such as protozoan cysts & bacteria. 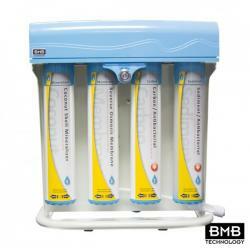 Easy Maintenance - Replacement filter cartridges are generally inexpensive and readily available. 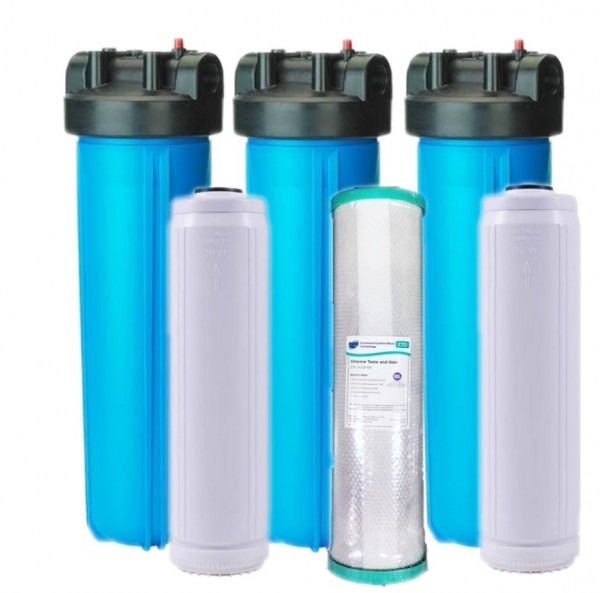 Filters will vary in the service life of the filter cartridge depending on the type of media employed, useage and the condition of the incoming water supply and can vary from 3 months to three years, but is normally around 9 - 12 months for most types. Changing is just a matter of shutting off the supply, unscrewing the old and screwing on the new. There are two main divisions of water filters for home use and the choice will depend on your situation; what you want to take out and your budget. The initial choice will be between a whole house water filter system or a dedicated undercounter water filter for drinking water, possibly with the addition of a shower filter. A whole house water filter can consist of a single filter housing or a combination of two or even three filter elements in sequence, depending on the required flow rate and the contaminants present. Such filter cartridges may include sediment filters, activated carbon as carbon block or GAC (Granular Activated Carbon), Active Ceramics and KDF media. A whole house filtration system would normally be situated close to where the water main enters the property and should be installed with a simple by-pass system for easy maintenance and cartridge change. One advantage of situating a filter in this position is it allows the installation of a specialist water filter for a particular purpose. For example you may wish to benefit from a fluoride reduction cartridge, or perhaps a specialist filter to remove chloramine which is not removed very effectively by many undersink water filters; it may in some cases be advantageous to fit a specialist filter for the whole house where you have a specific issue that needs treatment, even if you are only primarily concerned about your drinking water. An under sink or undercounter water filter system is the ideal choice where you are only concerned about the quality of your drinking water. Inline water filter systems are often very compact units, taking up very little space and are amazing at removing contaminants given their compact size. Practically all will remove chlorine very effectively at to levels close to 100%, giving a huge improvement in taste & odor. Generally available as single or twin housing arrangements they can be chosen to address both general and specific issues. For example the popular Osmio EZFITPRO-300 twin housing filter contains two cartridges, the powerful Coldstream CF108W high performing ceramic cartridge, capable of fluoride removal in addition to chlorine, heavy metals and bacteria and cysts, making it the most powerful ceramic cartridge currently on the market. This is used in combination with Watts 2.5 x 10 GAC/Phosphate & De-Alk Filter which as well as being effective against chlorine, taste and odour, heavy metals e.g. lead, and will also tackle hard water, reducing scum and limescale in your kettle. All of this is achieved with a filter system which takes up only 300 x 315 x 125mm and costs under £124. 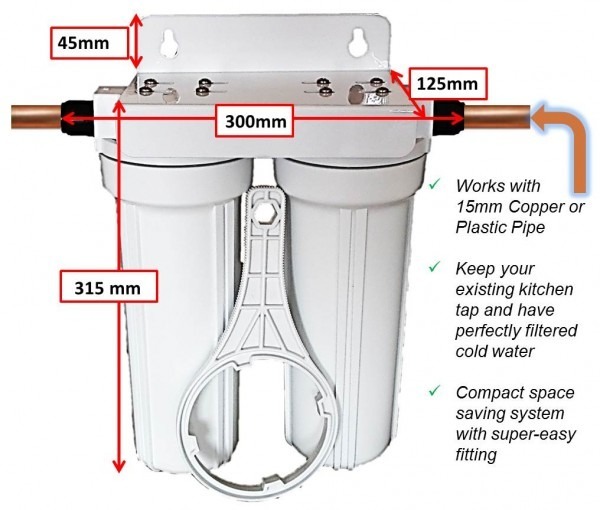 A special feature of the EZFITPRO series is that unlike most under sink water filters they have 15mm inlet and outlet ports which means that you can just connect them directly onto your 15mm supply pipe with the simple push fit connectors attached. 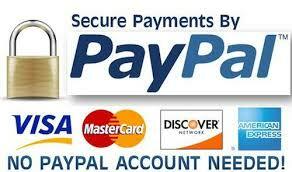 This means that you can use your existing kitchen tap and all the water flowing through this will be filtered. A further example of an excellent and easily fitted undercounter filter is the Eco Maxi 10” Inline 15mm Water filter, a single cartridge but with dual filtration stages it too is able to reduce limescale, chlorine, tastes, odours & many other contaminants and takes up a tiny amount of space. Reverse osmosis represents probably the top purification system available for home use in terms of the amount of contaminants removed. Consisting of a reverse osmosis membrane normally in combination with a sediment pre filter and one or more carbon filters, the purity of the water produced is unsurpassed. The RO units supplied by Puriflow Filters may contain a total of between 5 and 9 separate filter elements and can include re-mineralising, alkalising and oxygenating filters to improve the quality of the water further. This is considered necessary by many as the efficiency of an RO filter means that it removes what are considered to be beneficial minerals as well as the unwanted stuff. The inclusion of these extra stages redresses this issue. A reverse osmosis water filter system may take up a little more space than most inline filters will mainly due to the storage tank which accompanies the system but it is often possible to site them in an adjacent cabinet. 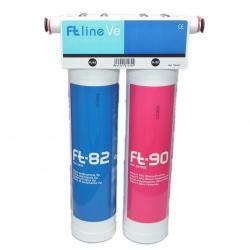 Some models of reverse osmosis filters known as direct flow or tankless systems do not require a tank. Employing two or more membranes they are able to provide a higher flow rate avoiding the requirement for a storage tank. An RO water filter is usually supplied with a single dispenser water filter tap but many people prefer to replace their existing kitchen tap with a three way or triflow tap which is an elegant solution if you don’t wish to drill a hole through your kitchen worktop. Choice of an RO system will be influenced by budget but you should avoid many of the cheaper systems on the market which will give trouble after a while. 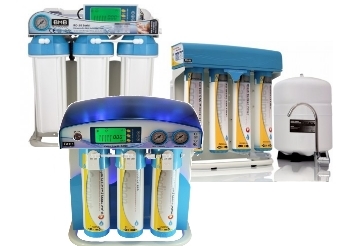 Puriflows RO units have been chosen to provide the best possible combination of quality, efficiency, reliability and cost effectiveness and range in price from £153 for the Osmio Greyline 5 Stage unit up to £889.50 for the top of the range BMB NOVA PRO 9 Stage Direct Flow reverse osmosis system. If you are unsure which home water filter system is the best for your needs plaese give us a call on 020-3507-1879 or email us at info@puriflowfilters.co.uk where we will be pleased to offer assistance. Chlorine - What Is It Doing To Your Health? Cryptosporidium - What is It? Should You Be Concerned? Whole House Water Filter v Drinking Water Filter – What's the Best Choice? Copyright © 2019 Puriflow Water Solutions Ltd., All Rights Reserved.